Oozing grace and elegance, Paradise Peak is the most luxurious ship cruising Halong Bay. Combining opulence, comfort and discretion, the top-of-the-line wooden junk not only meets but exceeds expectations. Each expansive cabin features a spacious balcony or private dining area, Jacuzzi, and includes a butler service. With a day spa, library and fitness room, an exquisite menu and world class wines, Paradise Peak is the epitome of deluxe cruising. Built from the finest materials, with attention paid to the tiniest of details, the Peak rules Halong Bay with style and sophistication. Once you have embarked, you will be taken to the restaurant where you’ll meet the Paradise Peak crew. While you enjoy your welcome drink, you will be given a short briefing about your cruise and itinerary. Don’t forget – your butler will take care of your every need while you are on board. 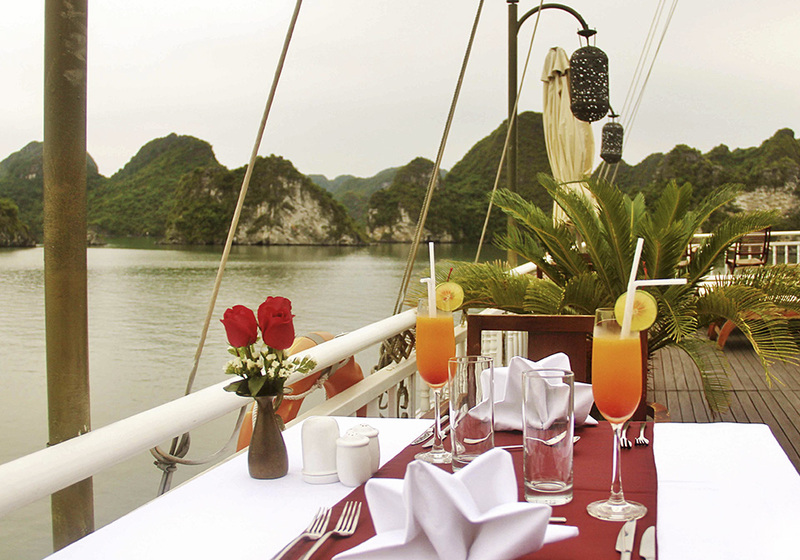 Lunch will be served in the restaurant while cruising the islands and islets of stunning Ha Long Bay. Your first excursion is a visit to Tung Sau Pearl Farm, an area in Ha Long Bay dedicated to growing pearls and practicing a handmade technique based on Vietnamese tradition and Japanese technology. This is also an ideal destination for kayaking. If this excursion doesn’t take your fancy, stay on board and treat yourself to a delicious afternoon tea. Enjoy your Paradise Royal Dinner your way – dine anywhere you want on the ship: your cabin, the sundeck or the restaurant. It really is up to you. After dinner, the rest of the evening is yours to enjoy: squid fishing, a movie in your cabin, more drinks* on the sundeck or even a spa treatment atLe Parfum Spa*. Paradise Peak arrives at “must see” Titop Island. Hike to the top for stunning views of Ha Long Bay, or go for a refreshing swim in the cool, emerald waters. For a more relaxing visit, you can people-watch while sipping on a coconut. Due to cruising conditions, itineraries may change without prior notice. Wi-Fi is available in the restaurant/bar area, but internet connectivity is limited due to the geography of Ha Long. Thank you for your understanding. Once you have embarked, you will be taken to the restaurant where you’ll meet the Paradise Peak crew. While your enjoy your welcome drink, you will be given a short briefing about your cruise and itinerary, don’t forget – your butler will take care of your every need while you are on board. On board Paradise Peak, you can dine anywhere. You can have your lunch served in the restaurant, sundeck or your cabin. After lunch is the time to contemplate the timeless beauty of Ha Long Bay as Paradise Peak cruises past the limestone islands, islets and towers. Alternatively, you may wish to use this time for a spa treatment at Le Parfum Spa*. Your second stop of the day is the magnificent Sung Sot Cave. The cave itself is stunning but so are the views on exit, where you’ll be rewarded with sweeping views across the Bay. 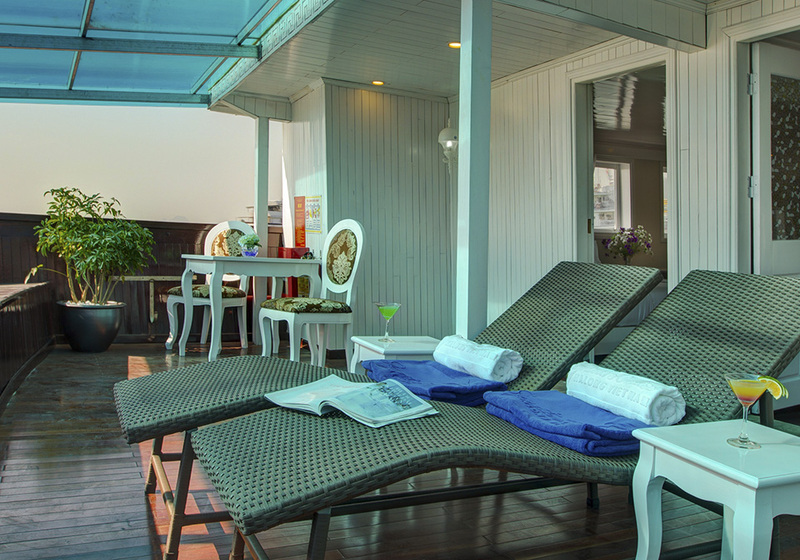 movie in your cabin, more drinks* on the sundeck or even a spa treatment at Le Parfum Spa*. Awaken your senses with a Tai Chi session on the sundeck before breakfast. Breathe in the fresh morning air, watch the sunrise and feel your body revitalise. Your fresh and healthy breakfast is served in the restaurant, ahead of a full day of excursions. Make sure you remember to bring all the items necessary for an enjoyable day in Ha Long Bay, like your camera and sunscreen. Paradise Peak arrives at “must-see” Titop Island. Hike to the top for stunning views of Ha Long Bay, or go for a refreshing swim in the cool, emerald waters. For a more relaxing visit, you can people-watch while sipping on a coconut. After visiting the must-see Titop Island, your next stop will be Trong Cave, in Bo Hon Island. Inside the cave, all visitors will be surprised by so many stalacties hung down from the ceiling. 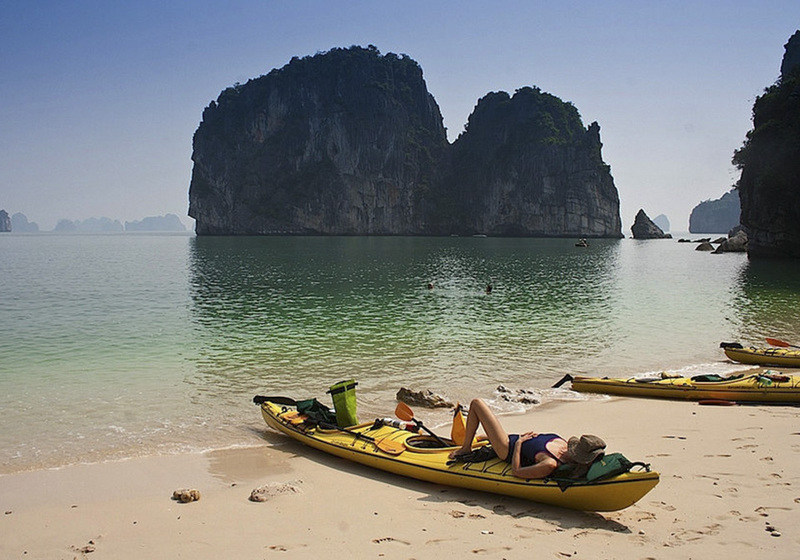 This is also an ideal destination for those who would like to kayak. After the morning’s excursions, a fresh and delicious Vietnamese set lunch is served in the restaurant. Visit Cua Van Floating Village – the largest of five remaining floating fishing village in the Bay. You will be transported there by locals rowing bamboo boats or you can kayak* at your own pace. A visit to this village is like stepping back in time, and is a reminder of the rich cultural history of Ha Long Bay. The Paradise Peak will again anchor overnight at Coconut Tree Island. Watch the sun set while enjoying Pre-Dinner Sunset Cocktails* on the sundeck, followed by a cooking demonstration and pre-dinner cocktails*. This is your last dinner aboard Paradise Peak, savour these precious moments by dining in any spot that suits you. The rest of the evening is can be as active or relaxing as you choose. You could give squid fishing a try or simply relax with a movie and a nightcap movie in your cabin. 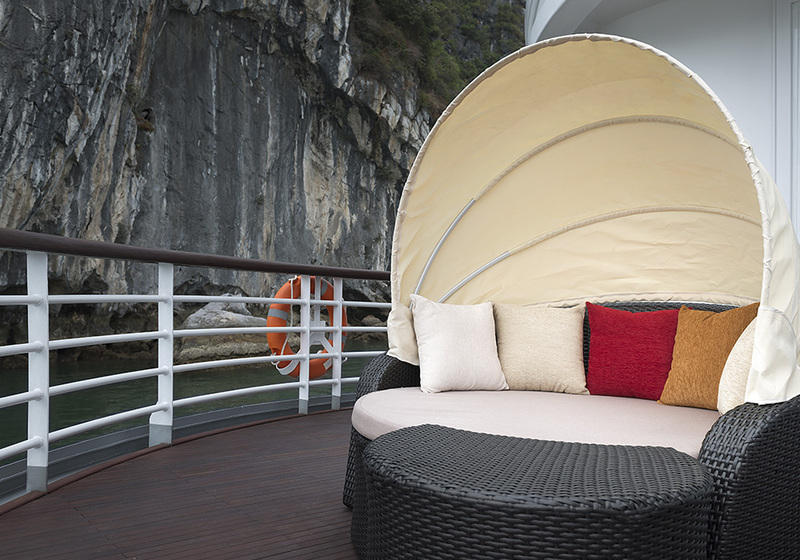 your cabin or on the sundeck, watching Ha Long Bay drift past. Prepare for the day ahead with a freshly prepared and healthy breakfast. Bill settlement and check-out. Fresh, locally sourced seafood and in-season fruits and vegetables are the hero ingredients of the Paradise Peak menu. Each element is hand-picked and cooked to perfection by the Peak’s resident chef, and best enjoyed while experiencing majestic views of Halong Bay. At breakfast, delight in à la carte classics, for lunch savor freshly caught seafood specialties and for dinner, choose from an extensive à la carte menu. Meals are included with all cruise packages, and Paradise Peak can cater for those with dietary restrictions.